I love history. It was my major during my undergraduate studies. It is fascinating to discover the past "as it really was", devoid of any modern romanticism. That's the way it's done in an academic setting. Historical fiction can be interesting, yet many such novels and Hollywood movies present a very rosy picture of the past. At their least offensive, historical fictions change certain facts and ignore others to tell entertaining stories. I loved the 1995 movie Braveheart. There is very little historical accuracy in Mel Gibson's portrayal of the Scottish rebellion lead by the hero William Wallace; Scotland's King Alexander III died in 1296, not 1276 as suggested in the movie and there had been peace between England and Scotland for 60 years. The Scots of the time period would not have worn plaids. Primae Noctis (or droit du seigneur) was never a real thing. 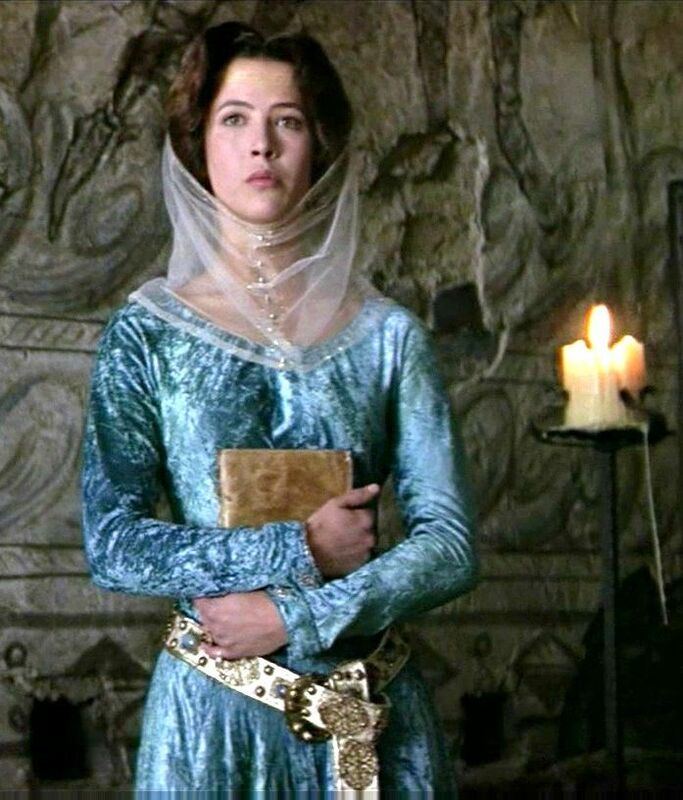 At the time of Wallace's rebellion in 1297-1298, Princess Isabella would have been about 9 years old and she was living in France; it is highly unlikely that she would have looked like Sophie Marceau and even more unlikely that she had an affair with William Wallace. But I can forgive these "liberties" more than I can forgive what I consider greater offenses: mythologizing and idealizing the past to suit our current beliefs and projecting our modern attitudes onto the past. Medieval Europeans did NOT believe the Earth was flat. The French, not George Washington, were largely responsible for the tactics and strategies that won the American War of Independence (links here and here), feminists NEVER publicly burned their bras. Historian Leopold von Ranke argued that the past should be studied "as it was", that is to say, in its own context. This does not always sit well with people, but it is logical. When someone claims they would have loved to live in another time period, they often assume their modern attitudes and opinions would still form the base of their character. This is a mistake, and it is why I'm thankful I live now. I'm not trying to judge or condemn the past, but I would NOT want to return to the days of prohibition. Sure the fashion was great, the music was swingin', there was no reality television, but dying of tuberculosis, measles or smallpox was probably not a good time. More superficially, trying to get some decent hooch (i.e. alcohol) was probably more difficult than Hollywood would have us believe. So while I had to drive to an LCBO a whole 20 kilometres away to find my bottle of Lot no. 40 Rye, I can't really complain too much. You can't fairly compare an apple pie to anything other than apple pie. Ditto for the other pies. Each must be compared on its own terms. 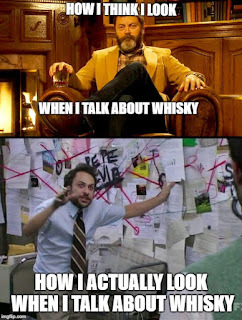 And so it is with whisky. I hope this makes sense. There's a time and place for every whisk(e)y. Finish: medium-long, spicy, slight vanilla note, black pepper with oakiness lingering. Adding water allows more complexity to shine through. 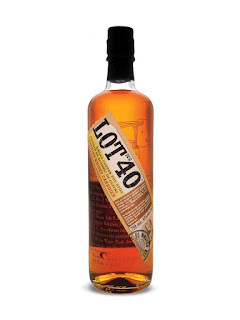 Lot 40 may seem like straightforward at first, but it deserves your full attention. With water, more herbal notes come through and some pipe tobacco makes an appearance. There is also a citrus note that becomes more evident with water, perhaps oranges. This whisky is even great in an Old Fashioned tumbler on the rocks. Hey, not every whisky needs to be sipped from a Glencairn all of the time. If a vessel can deliver whisky to my mouth, it is an appropriate vessel. Nick Offerman drinks his whisky from an Old Fashioned tumbler, so it's acceptable in my books. Nostalgia can be tricky. When a discontinued item is brought back, there will always be those who claim "the old one was better" or something along those lines, yet there are a whole lot of reasons to be thankful for the return of Lot no. 40. I never tried the old version, but this one is fantastic. 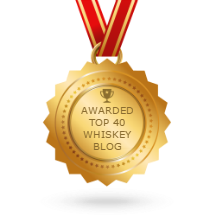 It is another whisky which makes me reconsider what I thought I knew about Canadian whisky. 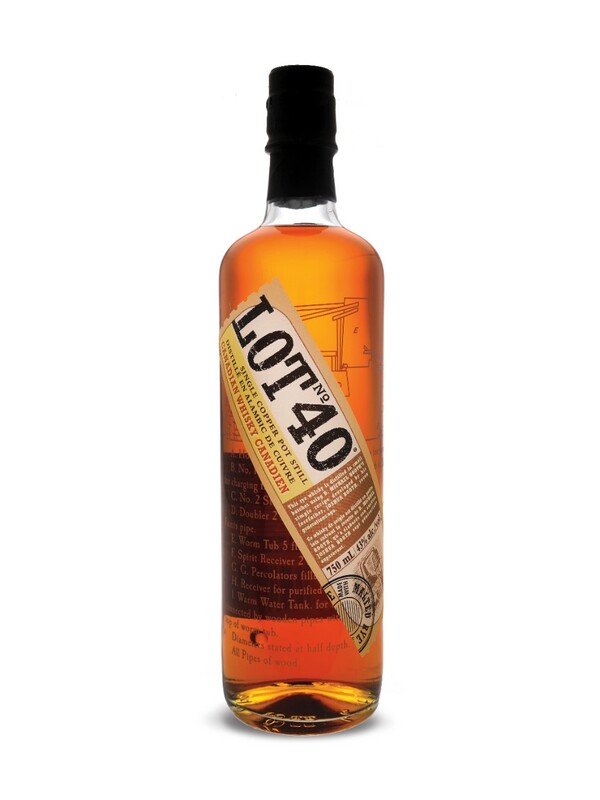 At $40 CAD, it is quite affordable and the flavour profile is a nice change from single malt scotch. Not better or worse; different. I strongly urge you to try it. I like it almost as much as Dissertation, so much so that I can't even rate it a half a moustache lower, and that's saying a Lot !